The Jacobite Rising of 1745 could not have taken place without French support. French ships carried Charles Edward Stuart to Scotland, French gold financed his campaign, and French weapons equipped many of his troops. 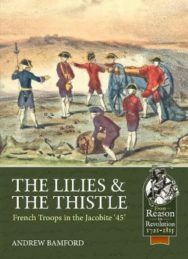 Yet the actual French military contribution to the campaign was small, and its role is frequently neglected.This book seeks to redress this balance by looking in detail at the French military contribution to the Jacobite ’45: the first detachment of troops to sail with the Prince – who instead of landing in Scotland found themselves caught up in an intense naval battle; the staff officers and professionals who helped Charles organise his army on modern European lines; and the Irish and Scots regulars who fought with distinction at Inverurie, Falkrik, and Culloden.As with many aspects of the ’45, myths and misconceptions aplenty have arisen about the nature and significance of the French contribution. New archival research enables a better picture to be obtained than ever before of the men who made up the rank and file of this contingent, and of the background and fates of those who led them. New analysis is offered, too, as to details of the uniforms worn by the detachments serving in Scotland, re-considering existing sources and also bringing out new information.Taken together, the result is to fill an important gap in our understanding of these dramatic events, one of the last occasions that foreign troops fought on British soil.